Do you have pallets for sale? For the best price contact Brampton Pallets. Do you need pallets quick? We can get you any size and quantity delivered the next day. We have been supplying a premier pallet service throughout the Cumbria area for over 50 years. Pallets bought and sold, collected and delivered! We are a family run business who has been supplying a premier pallet service throughout the Cumbria area for over 50 years. Brampton Pallets are a main pallet supplier for the local area due to the quality service and value for money provided. 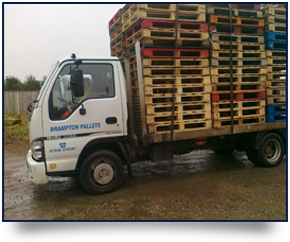 For a prompt service that is second to none contact Brampton Pallets.